Due to accreditation requirements, your objectives will show up in your course’s syllabus so the students will be able to find them there. However, you can really reinforce what the students will be getting out of course units and items by placing Unit and even Content Item level objectives. Starting out each unit by letting students know what they can expect from it will remind them why they are involved in those activities and reinforce with you the desire to align your curriculum. If a student knows why they are doing what they are doing, there will be less ambiguity for them and more satisfaction. Expectations helps the student to “sync up” to the course goals and objectives and thereby connecting them to you and the course on a foundational level. A great way for you and your students to “sync up” is to ask them how they are doing. 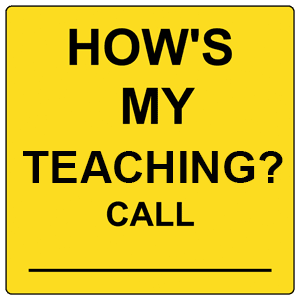 Find ways to reach out to your students and ask them how it’s going. Part of this you can do just by gauging the types of posts you receive in your “Virtual Office or “Course Q&A” discussion forum. You can identify trends and problems by perusing the posts that come in and respond to them during the course. You can also interpret the results you receive in the gradebook for this information. You can be more proactive and just ask the students. This may be a novel concept, but it works! Asking your students could take the form of an anonymous survey, or even a weekly reflection assignment that has as one of its goals the identification of high and low points of the week in your course. You can also poll your students during an informal chat sessions or webinar. Getting feedback from your students and acting on it (when merited) is a great way to get “in sync” with your online students. It is easy to get stuck in the rut of a post-reply mentality when it comes to your online course. Whether it is reading and replying to discussion posts, giving feedback on submitted assignments or just posting an announcement and replying to the subsequent e-mails, falling into the rhythm of asynchronous communication is not hard to do. Meeting with students in “real-time” plays an important role in any online course. It provides a sense of community for your students, reassuring them that they are not alone on their learning journey. 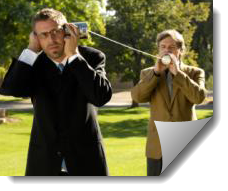 The students are able to hear you as a human being and not some depersonalized text on their monitors. 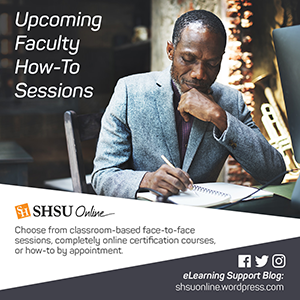 Establishing “office hours” for your course is a great best practice where you can let your students know certain times that you are available to meet synchronously. These can be conducted via an LMS chat program, Skype or other instant messaging program, a web meeting software (Blackboard Collaborate) or any number of web-based tools. When you take the time to make yourself available, listen and respond to student concerns, issues or just to let them vent, you are reducing frustration and anxiety, getting the students more comfortable with you and your teaching style and getting “in sync” with their learning journeys.